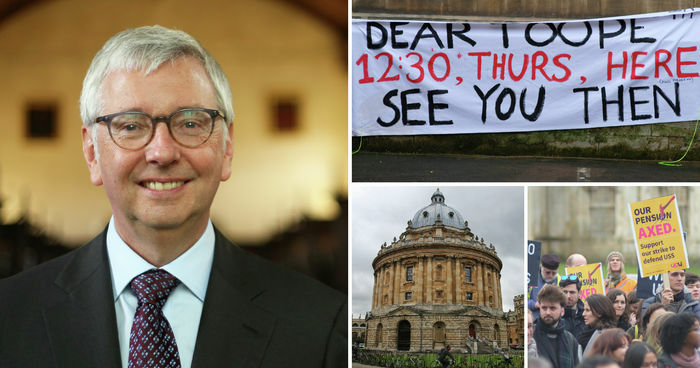 Students and gown-clad academics gathered to occupy Senate House lawn this afternoon, chanting questions to vice-chancellor Stephen Toope about central issues, beating on the doors of the Old Schools building and making a brief attempt to storm the buildings, as staff were seen watching from the windows. Students also encircled the building, trying to get through the back entrances before seeing all doors had guards assigned to them. To the sound of a saxophone, students danced and chanted, “Where’s Toope?”, while most academics hung behind. When it became clear that they were not going to enter the building, they promised to return next Tuesday. Today's rally, which saw an estimated 200 staff and students gather, followed Toope's announcement yesterday that he will call the University governing body to take greater risk and cost in the short-term, though this has been perceived by many to be an inadequate response as he has not called to maintain the defined benefits scheme. UCU member Dr Anne Alexander called for escalation of the campaign next week, saying “Cambridge UCU will be calling out to the people we’ve been working with already […] to build a campaign that takes our democratic and just demands to the thousands of people in this university we know stand with us.” The crowd echoed this call, rushing towards the doors of Old Schools.